Lutherville homeowners know how valuable good outdoor lighting can be. Lutherville homeowners know how valuable good outdoor lighting can be. As the days start getting shorter, you’re going to want to make sure that the lighting around the outside of your house isn’t just functional, but beautiful too. Here are some mistakes to avoid making this fall while you set up your lighting. When you need to make the most of your outdoor lighting, you need to make sure you place your lights as artfully as possible. Don’t let your Lutherville neighbors look down on you for how you set up your lights. Make sure you put enough lights over your driveway so you can see when you get home after dark. This becomes even more critical when you live alone, even in a safe neighborhood. Having the lights in the right place can make your dogwood trees and crepe myrtles look even more dazzling. If your backyard pool is still open, then you can still go for a nighttime swim. Just make sure you have enough lighting so everyone can move around more safely. Another problem you could run into is a lack of power. 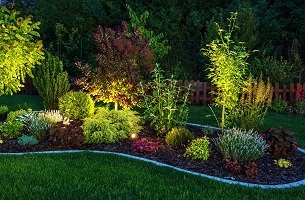 If you don’t have enough power sources, then your attempts to improve your outdoor lighting will suffer accordingly. Make sure you have enough power for all of the lights you want to include, whether they are floodlights or motion sensor lights. Lights give off more than just illumination. Whether they are inside your home or outside it, picking the wrong color can create an unpleasant effect that hurts the viewer’s eyes. Too much yellow in the light and it will look outdated and less than flattering. But if you err too much on the side of caution and go overboard with white outdoor lights, then you run the risk of making your lighting touches too boring. You’ll also need to watch out for how much glare your outdoor lights give off. After all, you can’t admire your Lutherville landscape if there’s too much glare causing you to look away. Think about where you place the lights and the angle that you set them. Adjust these factors and see if they make a difference. If they don’t, then it might be time to get some professional advice on what to do next. This entry was posted on Thursday, September 20th, 2018 at 4:11 pm. Both comments and pings are currently closed.